The dual identity of the Turkish city of Gaziantep - Turkish and now Syrian. And, why Romanian shepherds are both very traditional and very modern. 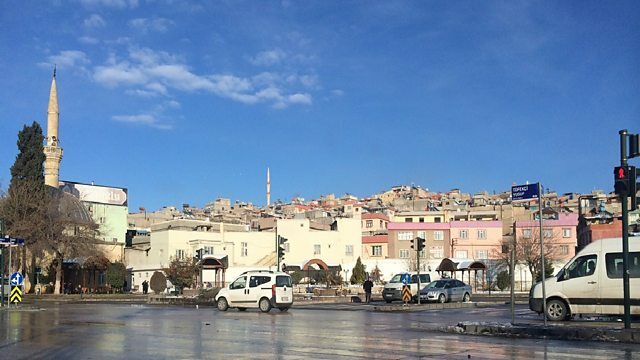 The Turkish city of Gaziantep is only two hours' drive from the Syrian city of Aleppo. The two share much of their history, architecture and culture - such as an enthusiasm for the cheese-based delicacy 'kanafa' or 'kunefe'. Until recently, Syrians would come on daytrips to Gaziantep to shop. Nowadays, the Syrians come as refugees and stay. As Tim Whewell found, there are now two Gazianteps - one Turkish and one Syrian - and the city now has become what Casablanca was to World War Two - a place of intrigue, clandestine meetings, and much networking among those who seek - or offer - financial and humanitarian aid. Shepherds have a special place in Romania's history. The country's defining myth revolves around them, they are meant to be a metaphor for Christianity (and behave accordingly), they agitated for independence in the 19th Century, and some got special treatment during the Communist regime. Caroline Juler finds that shepherds' life styles have not changed much in centuries - until now, when they need to negotiate motorways, television and Facebook, which has turned at least one of them into a celebrity.